What Is Uber Exactly? Here's How It Works. A location-based app that makes hiring an on-demand private driver...easy. For riders - Uber is a convenient, inexpensive and safe taxi service. Hire a private driver to pick you up & take you to your destination with the tap of a button on any smartphone device. A nearby driver often arrives to pick you up within minutes. Not only is this an on-demand car service, but you can even watch as your driver is en-route to come pick you up. For drivers - Uber provides exceptional pay, allows you to be your own boss, and even receive tips. Take on fares whenever you wish (work as much or as little as you desire) while meeting new people in your city from all walks of life. To start using Uber as a rider you must first signup to create an account. We recommend signing up with this promo to get $25 off your first rides. Proceed to download & install the app on your iPhone, Android, or Windows phone. You can easily see how much any ride will cost without the app by using Uber Estimate. When you have created your account and installed the app - launch the app! You will see a login prompt where you can sign in with the credentials you just provided during the signup process. Once you are logged in the next step will be to set up your preferred payment method such as a valid credit card or by linking your PayPal account. Note: This allows for a cash-free environment. You'll only be charged when you ride. Now you're ready! Whenever you need a ride; Simply open up the Uber app on your phone, ensure the pickup location is where you are now, select the car service you desire (from the bottom), tap "Set Pickup Location", then confirm by tapping "Tap To Request". *You must be at least 18 years old to ride with Uber (21+ to drive). The main car services that you're likely to see are uberX, uberXL, UberBLACK and UberSUV. 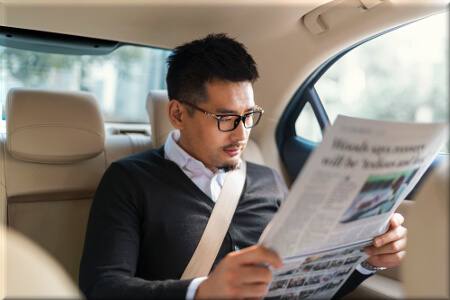 Driving for Uber lets you be your own boss, set your own hours, and earn a nominal wage - all in the comfort of your own vehicle. You must be at least 21 years old to become a driver. You also must own/have access to a good condition 4-door vehicle. The actual model and year requirements vary by car service & city-specific requirements - but it's safe to say that your car cannot be older than 2006 (in any city). For example Uber BLACK requires a higher end black sedan with leather interior. If you fit all of the criteria so far and have valid car insurance, your drivers license (for at least a year), and no major criminal history - you're ready to apply to become a driver. You'll receive a detailed welcome email upon approval telling you the final steps to start taking fares! Many people want to know just how safe Uber truly is, and rightfully so - Your safety is infinitely important. The truth is for a "taxi" service, Uber is extremely safe. Passengers get to rate their driver and overall experience after each ride, and drivers are reliant on good overall ratings (otherwise they'll get the boot). Likewise, drivers get to rate the passenger after each ride; So other drivers can get a heads up if a rider is troublesome or belligerent. As of recently Uber has been giving their driver and passenger overall user experience and personal security protocols a complete overhaul. User safety has always been important at Uber; But it's never been a bigger priority than it is today. Watch this video to learn the basics!